:: I'm no longer pregnant (or blogging in my underwear. So sorry about that!). :: Baby Sister Sophia Noelle was born. :: Big Brother Noah is almost four. And much has stayed the same. We're working. And playing! And we're busy. But not too busy to blog...anymore. More coming soon! 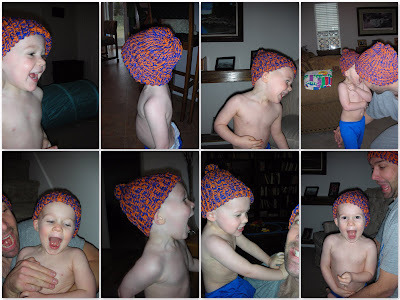 So it's come to this: I'm blogging in my underwear. I promise I will put clothes on by the time Noah gets up from his nap. And there are no pictures attached to this post, thankfully! Dave returned late last night from being gone all week for work. Noah is so excited to have him back home! Tonight, as we were eating dinner Noah told me, "I love Daddy so much!" He then put his arms around Dave, gave him a tight squeeze and added, "He's my best friend." Wow. He's never said anything like that before, about anybody! So cool. This parenting thing can be really, really hard. Sometimes, it's "I'm so tired, I just can't deal with this today." Other times, it's "this is going to take every ounce of my energy, every ounce of my determination & every ounce of my stick-to-it-ness-or-my-son-is-never-going-to-learn." It's been one of those days. It started out fine, until I finished my shower & came downstairs to find Noah, emptying an entire container of dog food all over the kitchen floor, his little table & out the patio door. Argh. Me: "What are you doing, Littles?" Noah: Quite proud of himself, "Feeding Lucy." At this point, I'm still calm. Granted, he had good intentions. But this throws a wrench into my plans for the day. Wanted to run some errands & hit a few stores before taking Noah to the toy store as promised. 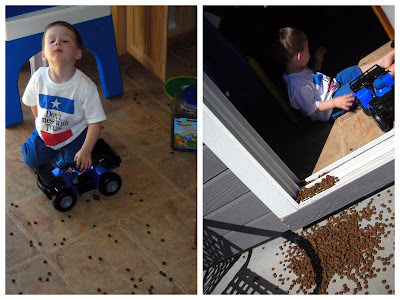 Didn't really want to spend time on my hands & knees cleaning up gritty dog food. I descended the stairs & did my best to engage Noah in the task. He wasn't at all interested, grabbed a toy & went in the other room. Me: "You made this mess, so you need to come clean it up." Noah: "You made the mess, you clean it up." So there I am, sitting in the middle of hundreds of pieces of dog food, making my choice. Go easy: clean it up & get us on our way? Or go tough: enact the lesson, engage in the battle of wills & hopefully emerge on the other side a better mother & son? I set my jaw & chose to go tough. - and an enormous amount of coaching: "You can do this." "You made this mess, you need to clean it up." "Keep on going." "It doesn't matter if you don't want to - you need to finish the job." And yes - 2 hours later, he finally picked up the last piece and put it back. Completely exhausted, we ascended the stairs for his nap. We talked again about how necessary it was that he finish what he started, that he help out & clean up after himself. And I made sure he knew how proud of him I was. I think we both learned a lesson. Not an easy one, that's for sure. And I think it's time for my nap. And what a day it's been! 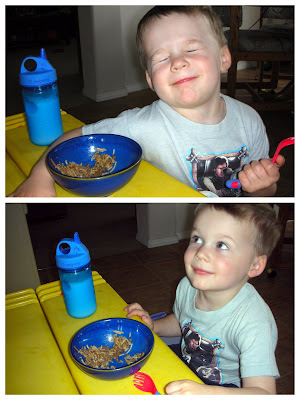 Noah decided to be 'super big boy' all of a sudden, and ate an entire bowl of hamburger & rice with a spoon (ok, a spork). We have been trying for weeks to get him to use a spoon completely on his own, but he hates the mess (yes, he's my child). But he decided today was the day & went for it. He had a few casualties, but kept going. Here's my boy, quite proud of his accomplishments. My great success of the day was surprising Dave with a big cookie delivery at the training he's conducting in Wenatchee. He's actually out of town today, and birthdays are big celebrations in our house - so I had to get creative. It took some energy & research, but was totally worth it! 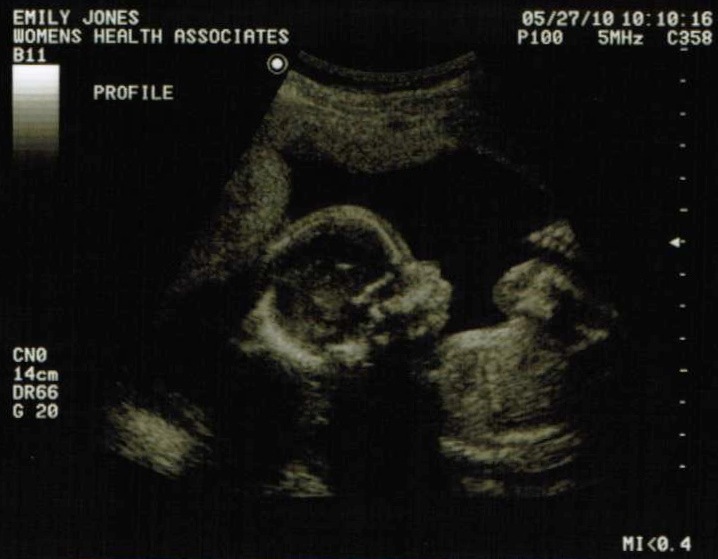 Here she is...our beautiful baby girl at 19.5 weeks! More pictures and the beautiful hydrangea we bought after the ultrasound & a most fabulous lunch at Goldy's, our fav breakfast spot. I found out first - expected such a thing was true, but waited plenty of time to make sure. Told Dave through his Valentine's Day gift (a baby outfit, paci & bottle drying rack - long story). My boys got me a beautiful orchid (still as gorgeous today as it was almost 4 mos. ago). 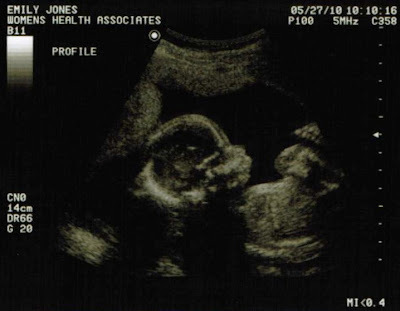 I was 5 weeks along at that point, and Baby was the size of a poppyseed. We told our families at Week 9. 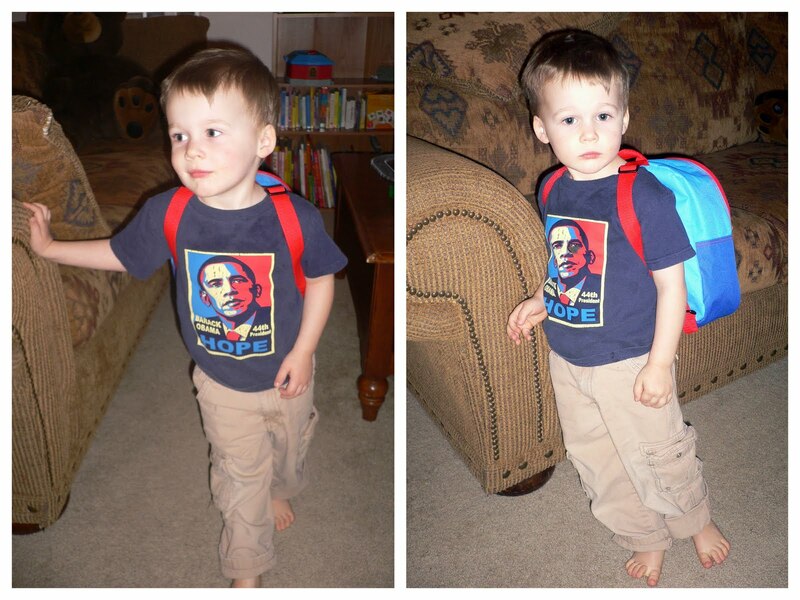 The plan: for Noah to share our joyous news by sporting a "Big Brother" shirt & yelling "SURPRISE!" 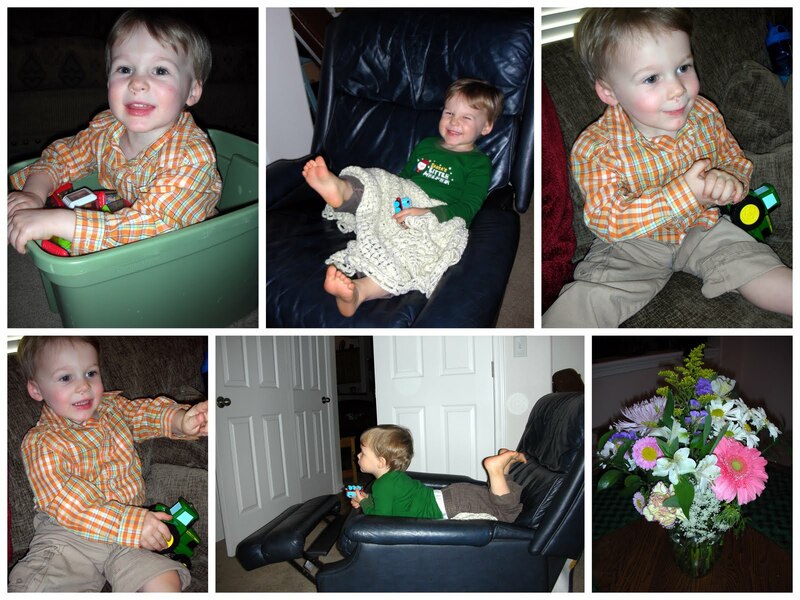 The reality: at the Jones farm, he demanded to go down for a nap moments before lunch, when our plan was to be staged. So we showed them the shirt instead. We at least got him in it for the Redmans, though it was our first morning at DisneyWorld & he was grumpy, so he ended up bursting into tears when everyone saw his shirt & got excited. It was classic! 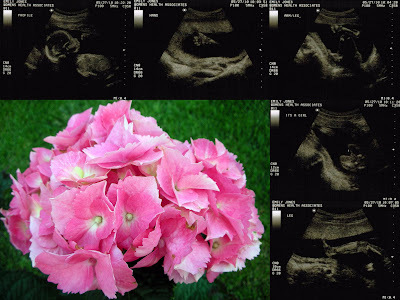 My pregnancy has been uneventful (thank you, Lord) & has flown by. 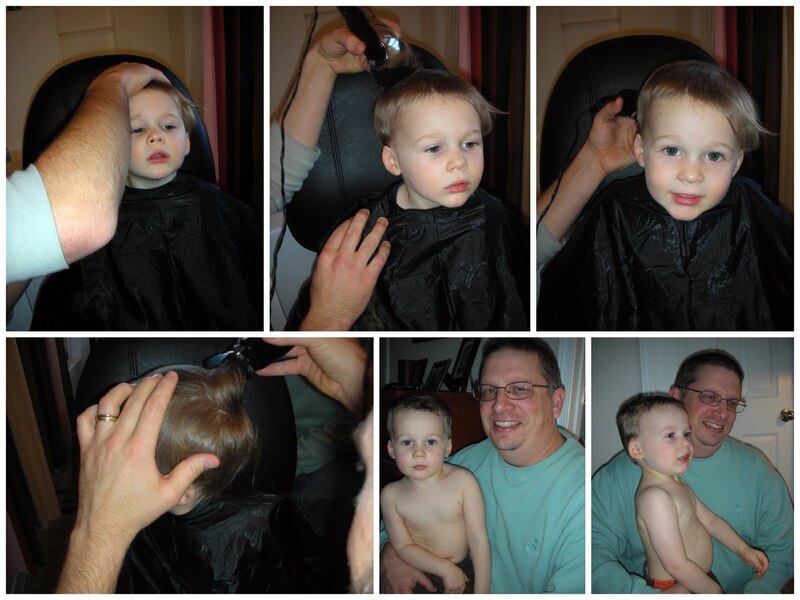 It's pretty textbook 2nd child: no pictures, a tardy blog mention, & very little to-do thus far. The one outside my tummy currently demands far more attention than the one inside! But we are having fun introducing Baby to Noah. Noah has decided he has a baby in his tummy, too, and is already preparing to teach 'Mommy's Baby' how to sleep & play trains. We think he'll be quite the Big Brother. April: For Easter Sunday, Noah wore one of Dave's old outfits: a fabulously 70s vest/pants outfit just perfect for spring. He loved it & was adorable! 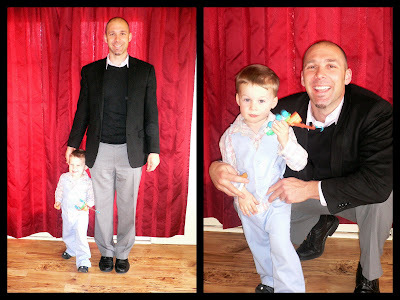 My boys, all ready for church! May: Noah, sporting his favorite T (I promise, again, that he has chosen this favorite all on his own) & Thomas backpack...and striking quite the JCPenney model pose in the 2nd pic! 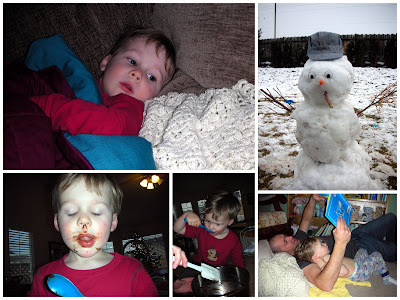 Noah's Quarterly Report: January - March, 2010. February: We played; watched more movies (I promise we don't watch that much TV); enjoyed a 'new to us' recliner; & Noah got me flowers one day for absolutely no reason. I love that kid! March: We played trains. Here, & at Papi/Yaya's house. 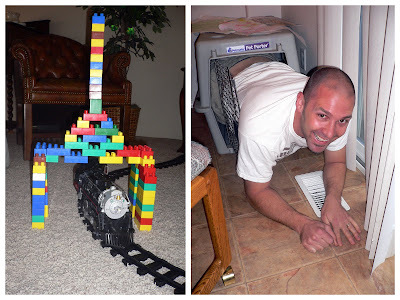 And built tunnels. And put Daddy in Lucy's cage. And went to Walt Disney World, but that's the subject of another post (I've got to organize pictures before that one will happen)!